With the new #AvGeek thoughts in mind, the last thing I wanted was flying the same aircraft twice. But things seems to be beyond my control as I sat down planning a vacation at home in April. Now 'Vacation' is a misnomer, since these holidays never extend 3 days at the most. This journey was initially slated to be 3 days long, but later extended to 4 days. Like everytime, I had booked my return ticket first - I was to return on a very busy day and hence booking at an affordable price was important (more on this booking later). After booking the return ticket, I got down to the task of finding an outbound ticket. A couple of days later, my brother declared that we both would be travelling together - and he wanted a night flight out of Bangalore. The options were AirAsia (Again!) and Jet Airways (on my fav ATRs!). My brother picked AirAsia - we booked on I51129, departing on a Friday night. When booking, the flight was timed at 2140hrs from Bangalore. A few days before departure (about 10 days before), a mail from AirAsia intimated that the flight was rescheduled to 2040hrs from Bangalore. This meant a bit of discomfort for my brother, but I was excited that my waiting time after office comes down! I left office as usual, around 1630hrs. I had plenty of time to kill - I decided to travel around the city to kill time. Sometime during the travelling, my bro called up and we reached a common place. My bro was driving down to the airport, and was leaving his car at the long term parking there. We reached the airport sometime around 1800hrs - and we had over two long hours to kill there. First up was the food joins on the kerbside - after having a hearty eat, the next stop was the check-in counters. I usually prefer checking in at the counter than doing it online - especially when my seats are preselected. The counter had very little crowd - rather, just a couple of people ahead of us. Ours was the only departure at that time, and that would be the last domestic departure for the day as well. Check-in was done real quick - we had the boarding passes by 1900hrs. Being the start of a fairly long weekend, I had anticipated some long queues at security - but that wasn't the case. Security check was deserted - but surprisingly quite a few people were caught with liquor bottles in their hand baggage, and this slowed down the progress. Even then, we were past security by 1910hrs - we still had over an hour to go for boarding! The security hold wasn't very crowded - unusually. We were to board from Gate #6, a bus gate. Instead of heading downstairs, we decided to wait at the upper level itself. Quite surprisingly, the Airport WiFi worked for me on this day, and could spend some time catching up with messages on WhatsApp and some FB browsing as well. We did not head downstairs until 2000hrs. As expected it was very crowded downstairs, and we couldn't find any place to sit. 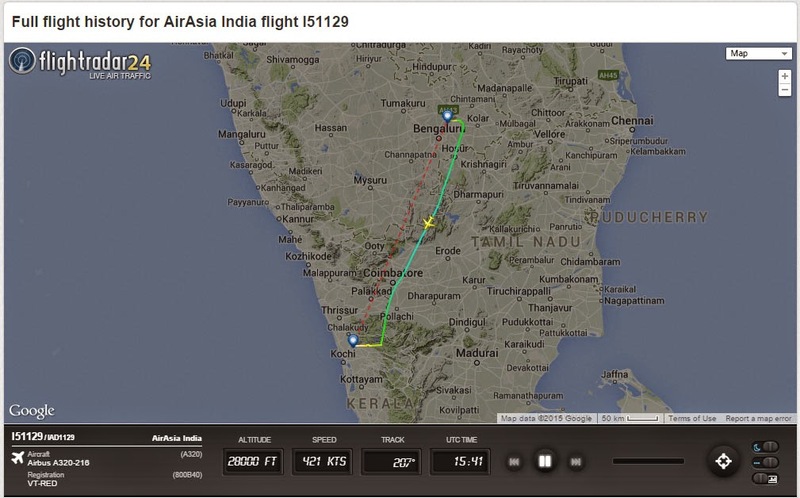 There were two flights to Kochi at the same time - a Jet Airways and our Air Asia. Interestingly, both were boarding from adjacent gates. By the time our boarding started, Jet had completed boarding. The gate agent turned up around 2005hrs - and was waiting for the crew to get through. Once the cabin crew went in, boarding was called. At around 2011hrs, the boarding process started. I had a quick glance on the check-in terminal,and found we were have a load of 168/180 on that day. We were among the first to get into the bus. The deck crew also got into the same bus. Boarding about to begin. Like the notice says, there are no boarding announcements! We reached the aircraft by 2015hrs - it was VT-RED again for me! We had to wait for sometime before we were let into the aircraft. We were inside the aircraft by 2019hrs. Boarding was taking some time - the second bus turned up quite late. Then the headcount procedure took some time. Boarding was finally completed at 2031hrs. The doors weren't armed until 2040hrs - the scheduled departure time. Soon after the doors were armed, the safety demonstration began. In the deck were Capt Alireza and Capt Bhuvnesh, while the cabin had an all female crew led by Mukta. We were pushed back at 2042hrs, and taxi commenced at 2045hrs. We headed towards Rwy09 - it was one really long run. On the way, I could have a quick glance of VT-APA (Air Pegasus' ATR72). We had to hold short of the runway (2052hrs) to let a JetAirways B737 to land. We entered the active runway shortly thereafter, and were finally airborne at 2054hrs. The climb was quick and the seatbelt signs were turned off at 2059hrs. On-board sales started soon after. I was engrossed in reading the in-flight magazine though - there were two magazines this time. One was Travel3Sixty (their international inflight magazine) and the other was called Travel3Sixty India (an India specific inflight magazine). 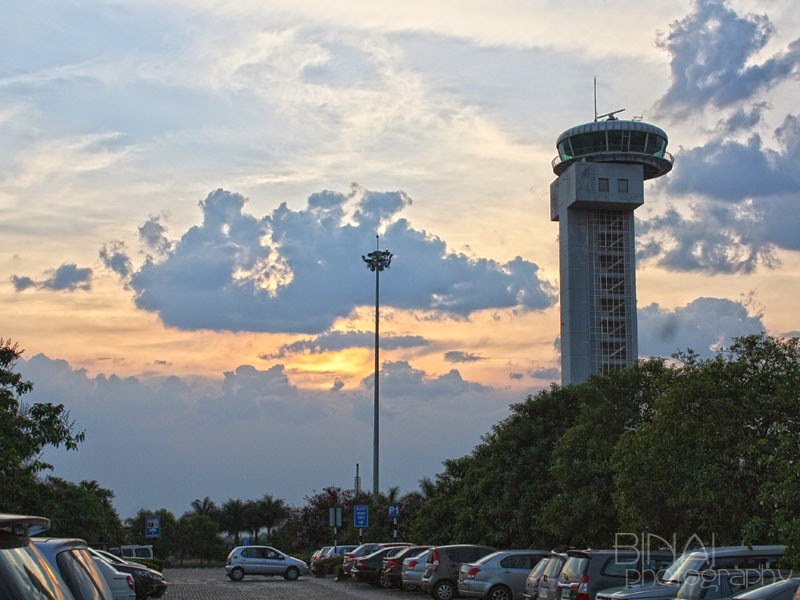 The former had a lot of tourist articles detailing places mostly served by the AirAsia Group, while the latter had dedicated write-ups about tourist locales around each destination served by AirAsia India. The cabin crew were great - marking their wares quite aggressively. I chose to have a serving of water. A quick round of clearing followed. Landing was announced at 2125hrs - the regular prelanding procedures followed. Cabin crew did a couple of walk around checks to confirm that the cabin was prepared for landing. This was my second night time flight to Kochi, and hence had a tough time finding which side we were approaching from. Since none of my usual landmarks came in sight, I was expecting we'd land on Rwy09 - but as we came closer to land, it was clear that we were on the normal approach to Rwy27. We finally touched down on Rwy27 at 2139hrs, and quickly taxied to the apron. Quite unusually, the aircraft we towards a stand away from the terminal building. We parked at Stand #10 at 2142hrs. It took quite sometime for the stairs to be connected. Deplaning started only at 2146hrs - and as usual, passengers had already crowded the gangway. While I was just getting into the bus that would take us to the terminal, Jet Airways' VT-JCR was pushed off. I am not very sure which schedule was that - there is no Jet Airways ATR at that time - the one coming in from Bangalore was yet to land - so this could be a delayed flight or some kind of a charter. Just as we were dropped at the terminal, the Jet Airways ATR from Bangalore (which left 10 minutes before us) taxi'd in to the apron. Since we did not have any check-in baggage, it was just a walk through the terminal building, and we were out of the airport by 2150hrs. That was another good flight with AirAsia India. A bit of my thoughts about AirAsia: They offer some great on-board service, but completely lose their plot due to the utter mismanagement. Flight reschedules are a daily affair - and they often wait till the last moment before they let the passengers know the rescheduling. 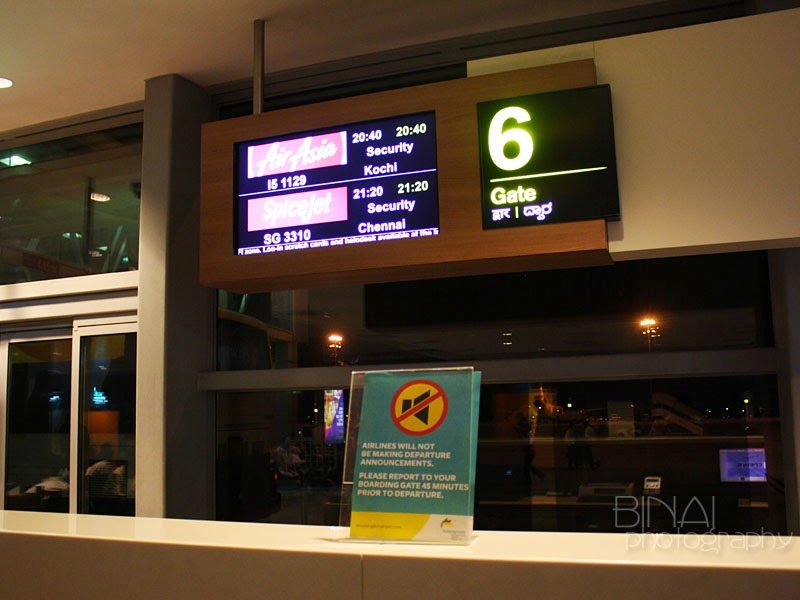 Due to the high risk of reschedules, one cannot really count on AirAsia if they need to be on time at the destination - its a fun filled airline for the leisurely passenger. Their on-board service should be something the other LCCs should adopt, while AirAsia needs to learn a lesson or two about sticking to their advertised schedules. Dirty seat-pockets and clumped up seat-belts are generally a norm on AirAsia - but not this time. All thanks to their 4 hour ground time. With the worst aircraft utilisation among the LCCs, AirAsia surely needs to learn a lot of lessons from the home grown LCCs.